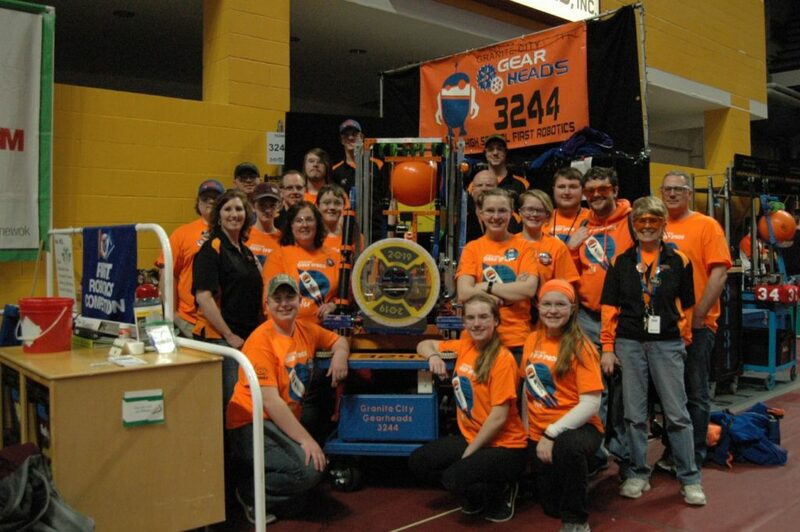 We are the Granite City Gearheads, FIRST Robotics Team 3244, from St. Cloud, Minnesota. Our team is composed of about 10 creative and diverse students, ranging from 9th-12th grade. Over the years we’ve had students from Apollo High School, Technical High School, Cathedral High School, St. John’s Prep, Sartell, Albany, and Holdingford. Our rookie year was 2010, and during our regional, we were surprised to find ourselves competing in the final match as substitute robot! Our alliance took 2nd place, and we were so proud. In 2013, we went to the FIRST Championship in St. Louis after being selected by the top alliance at the Minnesota 10,000 Lakes Regional. Last year, 2018, we were a finalist at the Medtronic Foundation Regional and also won the judges award for Innovation in Control from Rockwell. This qualified us to compete at Championships in Detroit. We ended up ranked 19th out of 64 in our division. We had an awesome time! This year we’re looking forward to working with our new and returning members. We will be competing in this year’s FIRST Robotics Competition event at The 10,000 Lakes Regional Presented by Medtronic Foundation at The University of Minnesota, Twin Cities. Each year FIRST issues a new design challenge in the form of a game with tasks the robots must complete to earn points. Every game is played with six robots, in randomized alliances of three, working together in a 27 by 54 ft. field. The matches are 2 minutes and 30 seconds long. This year FIRST is doing things a little differently. Instead of the traditional autonomous portion of the match during the first 15 seconds, there will be a simulated sandstorm, this will obscure the drivers’ view of the field. Teams can choose to use the traditional autonomous control, or instead use onboard cameras. After 15 seconds the sandstorm will clear and drivers can control their robot normally.